The art nouveau was an international style, often inspired by the curved lines of plants and flowers. The ‘total art style’ embraced a wide range of decorative arts between 1890 and 1910. 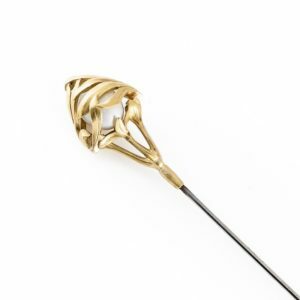 This art nouveau hatpin is shaped like bamboo leaves in 18 carat gold. 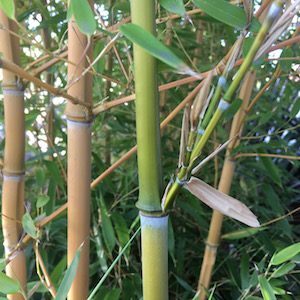 The natural pearl comes with a certificate. 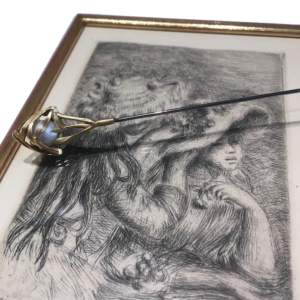 When the fashionistas from around 1900 started to secure their headwear with long hatpins, pierced through one side and protruding several inches out the other, this practical and beautiful accessory also had the potential to be a dangerous weapon. Accidentally, or because women defended themselves with their long pins. After an incident in New York, in 1903, there were several reports of hatpin injuries. Link for a further read to an online article ‘With daggers in her bonnet’. 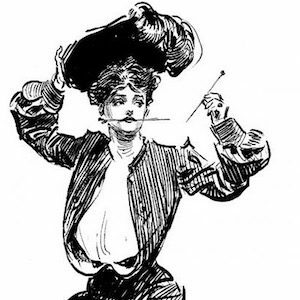 The 3rd picture (top) is “Hatpin girl” by Charles Dana Gibson (1867-1944). Picture right: Pierre-Auguste Renoir (1841-1919) Le chapeau épinglé (The Hat Secured with a Pin), Drypoint Etching.c. 1894. The women are seated in elegant dresses, wearing large hats with ribbons on them. The face of only one figure is visible while the other one is looking away from us, as she is busy adjusting her friend’s hat with a hatpin. ← And a blooming 2019!